As was widely reported in the media, a markdown in global economic prospects led to substantial selling pressure in U.S. equity markets on the morning of August 24. This order imbalance revealed weaknesses in the structure of equity markets that affected some domestic equity ETFs as well as some large, well-known U.S. stocks. As a result of these market structure vulnerabilities, the arbitrage mechanism for some domestic equity ETFs was temporarily impaired, leading them to trade at abnormal discounts to the estimated value of their underlying securities for about an hour that morning (see the blue line in the first chart below). When we examine the behavior of comparably sized domestic bond ETFs during that tumultuous period on August 24, we see no apparent spillover from the equity market to the market for bond ETFs. 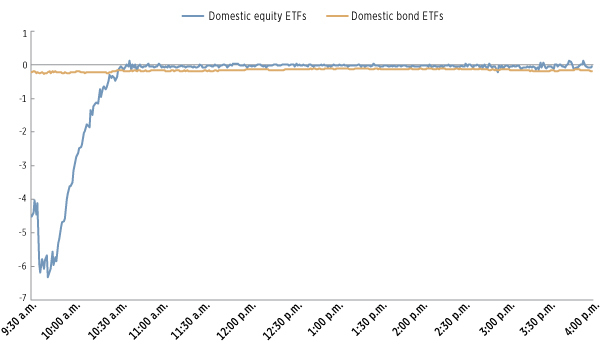 In fact, the average estimated discount for these domestic bond ETFs remained in a narrow range throughout the entire day (see the orange line in the first chart below). 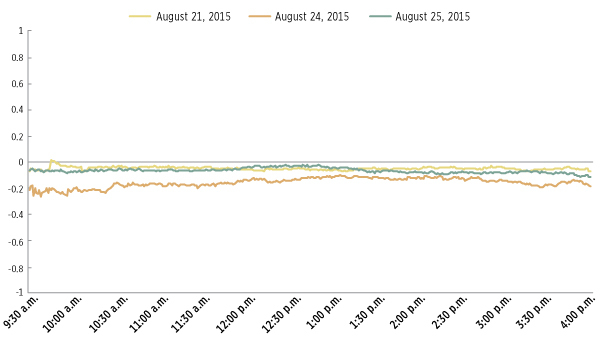 In addition, U.S. bond ETFs consistently traded at a discount immediately before and after Monday, August 24 (see the second chart below). The average discount over the day is slightly larger on August 24 (15 basis points) than on August 21 (5 basis points) and August 25 (6 basis points). But, this pattern is consistent with changes in bond markets in general. For example, credit spreads widened a bit on August 24 and partially reversed on August 25 as indicated by the options-adjusted spread on the Barclays U.S. Aggregate Bond Index (a benchmark index commonly used to assess performance of bond portfolios). Nevertheless, even if one believed the spillover hypothesis, a minor 10-basis-point increase in the average discount over the day showed, in our opinion, how resilient bond ETFs were on August 24. ¹ Simple average; estimated premium/discount for each ETF is calculated as the percent difference between its last traded price and its intraday indicative value. ² Consists of 50 domestic equity ETFs and 15 domestic bond ETFs. ² Consists of 15 domestic bond ETFs.